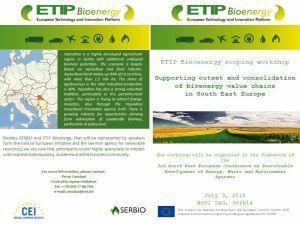 The Central European Initiative, in close cooperation with SERBIO, organizes a scoping workshop on biomass-for-energy perspectives in Vojvodina and the potential contribution of ETIP Bioenergy to un-tap them by bridging between local actors and EU stakeholders. The proposed format is a two-hour workshop / roundtable dedicated to highlighting the potentials and challenges of biomass-to-energy value chains in the Danube Region, and Vojvodina in particular, as well as to the role that the ETIP Bioenergy could play by enhancing policy-industry-research dialogue and foster collaboration between regions. The Agenda is still under development, yet a preliminary list of topics we will address includes: an overview of ETIP Bioenergy; a focus on the perspectives of Vojvodina as a producer of biomass and a potential regional player in transformation industry; a discussion on how could ETIP Bioenergy support these processes.